At this time of year, those of you that have children attending school orientation may also be purchasing the new school uniform. While this may be a simple task, I have a few pointers that will save you both time and money. Most schools will have a uniform shop on the premises which sells both new and second hand items. The decision for many of us to buy second hand can tend to be our budget, but for a good portion of parents, the idea of seconds is simply not on the cards. But no matter what you’re looking for, I have some great tips and tricks that can save you both time and money when it comes to purchasing a uniform for your school starter. Once orientation begins, parents are starting to raid the uniform shop. While there is no sense of urgency if you are buying new, second hand items that are still in great condition tend to go quickly, often leaving little to choose from and with a purchase that is perhaps not the quality you were hoping for. There is good news however if you leave the run a little late. The majority of second hand clothing items can tend to come in early into the next school year when parents have purchased a larger uniform for their already attending school child, and pass the old onto the shop. This can give you good reason not to purchase all that will be needed before that first day. While you may want to have at least one uniform ready to start in, keep ducking in to look for bargains once the school year begins, but choose carefully, there tends to be no exchange or refunds with second hand items. You will though save more than half the cost of the full priced item. If you’re not into buying second hand items, the purchasing of everything new is very expensive. I strongly recommend you purchase an additional second jumper if nothing else. You will be so grateful you did when faced with that morning rush and you can’t find that vital jumper on a cold day. So how many uniforms should you buy? If you are a working parent, to lighten your load, for boys, one shirt per day they must wear it and at least a couple of shirts and long pants. For girls a couple of tunics/dresses are usually enough and a million pairs of socks per child should do it. While uniform shops only tend to sell socks, tights and hats new, there is a good chance you can still find cheaper in one of the big department stores. For me though, I found the pricing of these items at my school reasonable so purchased there. If your school gives you the option between the zip up jacket and the jumper, consider going the jacket. It can be far easier for kids to take off and put back on themselves if they need to. Start now to teach about inside out sleeves and how to right them. If you are purchasing the second hand jacket, I urge you to stand there and pay close attention to the zip. Zip it up and down a number of times before buying. When second hand jackets reach the school uniform shop, they can still look great, bit it’s the zipper that can be just about to go, broken or simply too stiff for kids to do themselves. Take note of any emblems on the item. Are they cracked or faded? This makes for a very tired look, no matter what condition the jumper is in. Look closely at all buttons on the shirt including cuffs. Any missing or broken, any just about to fall off? With long sleeve shirts pay close attention to the ends of the sleeves. This is where kids tend to get nasty stains when they paint. If you’re on a budget and you want new, retail stores such as Target and K-Mart sell very reasonably priced shirts for boys in particular. Gotta love an elastic waist. So much easier for kids with toileting. If you can get shorts or long pants with a pocket AND zip, this is most handy. Buying the next size up might seem like a plan, but just make sure that elastic waist is still going to do the job, and do it well. Some schools such as my children’s have a variety of different style hats you can purchase. Before you do, look around at what the children in the school are currently wearing. Schools can tend to have different trends within the guidelines of the uniform. For example, at my children’s school, caps are more the go as opposed to the broad brim style. The priority for your child however should always be the best sunsmart hat. Many schools have a no hat no play policy so buy at least two. I like to keep a spare in the car and my kids each have two hats in their school bags. My kids wear legionnaire caps that fold up to be fairly small, so that extra hat in the bag only takes up a little extra space. With the broad brim hats, the space they take up would make this more difficult. Check for any holes in the pockets, and don’t forget to check the zip on the girls tunic pocket. Its a real pain if it’s broken, as kids tend to need this pocket for tissues, chap stick, canteen money, and other trinkets they like to carry. It is easy to make the mistake of buying the uniform with too much room to grow. This can cause discomfort for kids so no more than one size up. Check that hem, and make sure you have some room for movement there. On girls dresses there are usually two buttons on the back of the dress. Check they are not missing. Lost property at schools tends to be full for most of the year. The other day I witnessed Emma rummaging through the basket for missing items. There were probably no less than 12 jumpers in that basket. This tends to happen when the weather becomes warmer and kids take their jumpers off, put them down somewhere, and then forget about them. Labelling is vital. Children don’t tend to take their uniforms off at school very often but it does happen. The school concert or swimming are two examples of this. When labelling hats, put your child’s name in an easy to see place for your child. Kids will need this for quick reference as they are told to quickly grab their hats often. When it comes to labelling, my favourite method is to write straight onto the inside fabric. This way the name cannot fall off or be removed by cutting the tag off, the most popular place to write the child’s name. If a second hand item, ensure you remove all previous names. There is a good chance that item comes from a child still attending the school but they simply grew out of it. So ensure you not only relabel but remove all the old. Go the Velcro and ensure that the shoe has a D clip to keep the foot more firmly inside the shoe. I also strongly recommend you purchase a shoe with edging around the outside. This helps to better protect the shoe from scratches and scrapes which both add to the deterioration of the shoe. I learnt this the hard way. 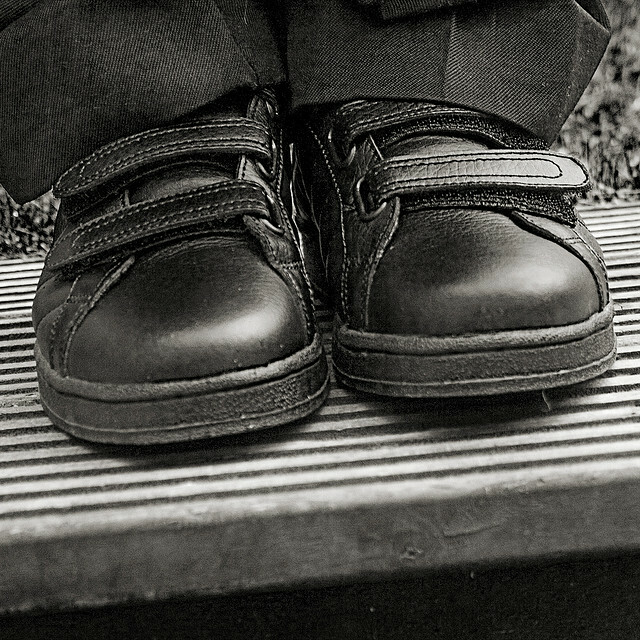 Get your kids wearing their shoes well before starting to get any niggling issues out of the way. Purchase time is best over that Christmas holiday period at least 2 weeks before they start school. Many schools sell school bags in one or two different sizes, or you can simply purchase your own outside the school if the school is happy for you to do so. It can be difficult to know how big a bag your child will need but consider for a moment what they will be putting into it. Jumper, hat, morning tea, lunch, homework, library bag, notes, pencil case, news item. The jumper and lunchbox alone can take up a fair amount of space, and while you don’t want a bag that is so big your child cant even carry it, you will need it to be able to hold all of these items, yes sometimes on the same day, with relative ease. Especially with a bag purchased from the school, place a large key or bag ring on it that your child can see from a distance. When everyone’s bag looks the same, it makes life more difficult for your kinder child. Know anyone else who has a child starting kinder next year? Pass this article on to help them make some good uniform purchasing decisions.